Modern motion control systems contribute significantly to intelligent industrial workflows, providing a high degree of flexibility, enabling convenient engineering and quick commissioning. 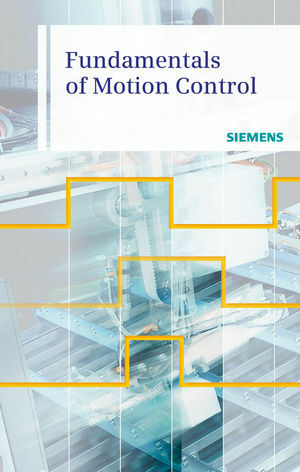 The book "Fundamentals of Motion Control" addresses apprentices or students of engineering occupations and, moreover, everybody requiring basic information on motion control and related topics. Focusing on practicability, it explains the principles of motion control in a most comprehensible way. First, the book presents basic principles of electromagnetism and the functionality of motion control systems, followed by a closer look on the different types of electrical motors and feedback components. Further, the book explains operation principles of speed control units on the basis of the Sinamics family which has been designed for mechanical and industrial engineering applications. The following overview of the motion control system Simotion allows deeper insights into programming and commands. Thinking field-oriented, application-based and product-specific, the book concludes with a vivid example application for beginners, a glossary explaining important topic-related technical terms and, eventually, presenting a list of resources as a signpost for further studies. The Siemens product family SINAMICS is the most comprehensive drive family available.